• keep the policy repo rate under the liquidity adjustment facility (LAF) unchanged at 6.0 per cent. 4. The latest assessment by the World Trade Organisation (WTO) for Q4 indicates a loss of momentum in global trade due to declining export orders. Crude oil prices touched a two-and-a-halfyear high in early November on account of the Organisation of the Petroleum Exporting Countries’ (OPEC) efforts to rebalance the market. Bullion prices have been under some selling pressure on account of the rising US dollar. Weak non-oil commodity prices and subdued wage dynamics have kept inflation contained in many AEs, while the inflation scenario remains diverse in major EMEs. 10. 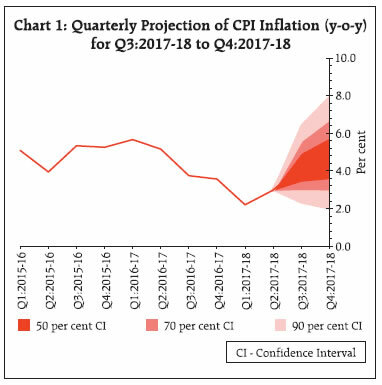 Retail inflation measured by year-on-year change in the consumer price index (CPI) recorded a sevenmonth high in October, driven by a sharp uptick in momentum, tempered partly by some favourable base effects. Food inflation was volatile in the last two months – declining sharply in September and bouncing back in October – due mainly to vegetables and fruits. Milk and eggs inflation has shown an uptick, while pulses inflation remained negative for the eleventh successive month in October. Cereal inflation remained stable. Fuel group inflation, which has been on an upward trajectory since July, accelerated further due to a sharp pick-up in inflation in liquefied petroleum gas (LPG), kerosene, coke and electricity. 14. Merchandise exports declined by 1.1 per cent in October 2017 after showing positive growth for 14 consecutive months. A sustained increase in exports of engineering goods, petroleum products and chemicals during the month was outweighed by a sharp fall in shipments of gems and jewellery, readymade garments, and drugs and pharmaceuticals. Imports continued to expand, though at a modest pace. Although gold imports rose sequentially in October, they moderated from their level a year ago. Consequently, the trade deficit widened again in October. Despite moderation in September, net foreign direct investment in H1 of 2017-18 was at the same level as a year ago. With the announcement of the recapitalisation plan for public sector banks, foreign portfolio inflows into equities resumed sharply in October, after recording outflows in the preceding month. India’s foreign exchange reserves were at US$ 401.94 billion on November 30, 2017. 16. 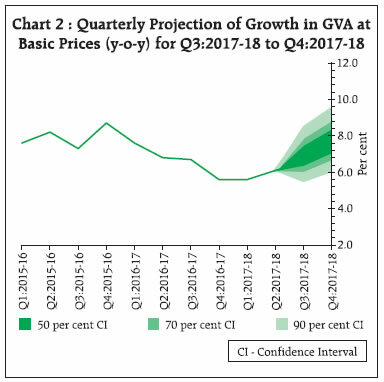 Turning to GVA projections, Q2 growth was lower than that projected in the October resolution. The recent increase in oil prices may have a negative impact on margins of firms and GVA growth. Shortfalls in kharif production and rabi sowing pose downside risks to the outlook for agriculture. On the positive side, there has been some pick up in credit growth in recent months. Recapitalisation of public sector banks may help improve credit flows further. While there has been weakness in some components of the services sector such as real estate, the Reserve Bank’s survey indicates that the services and infrastructure sectors are expecting an improvement in demand, financial conditions and the overall business situation in Q4. Taking into account the above factors, the projection of real GVA growth for 18-2017 of the October resolution at 6.7 per cent has been retained, with risks evenly balanced (Chart 2). * Released on December 06, 2017.